Quite quickly I figured out that Visual Studio is using my company account (as with the above command prompt) rather than the Microsoft account that I’m logged in with. In my case mu company account uses a stakeholder licence within Visual Studio online and stakeholder by default don’t have access to code. Then I tried the same within 3 versions of Visual Studio. 15.2 (26430.16) doesn’t require my windows account to be included in the project permissions. 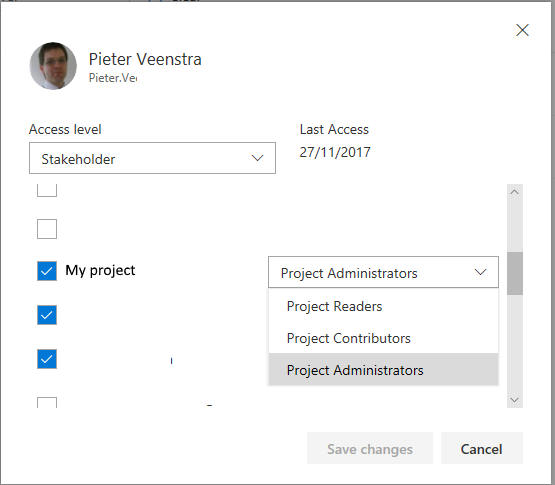 Pieter – thank you for this article – I came across this issue too (I am using VS2017 v15.6.4). I would add that my company account needed to have at least Basic level access to VSTS in addition to permissions on the Project & Git Repo. I was getting errors because my company account originally had only Stakeholder access. Thanks for your comment David. I’ve got the feeling that something has recently changed in this area.